On nights when you’re committed to staying in, thinking of a recipe to cook or cooking at all can seem like more effort than it’s worth. 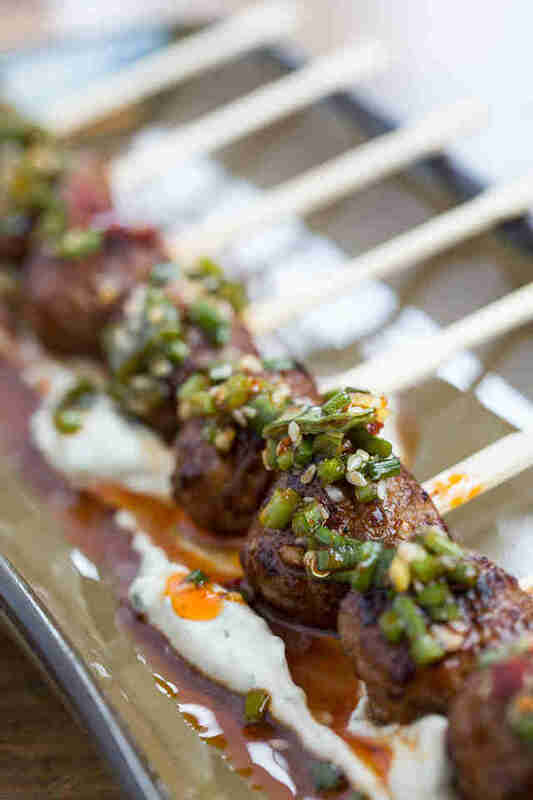 What if you could prepare a restaurant-level meal with minimal ingredients and steps? 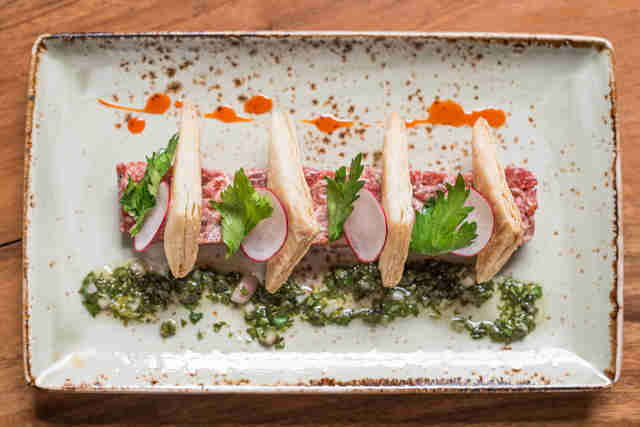 We asked eight of Chicago’s top chefs to come up with their best five-ingredient recipes that even the novice cook can prepare at home. With chorizo rice, pasta with jalapeños and bacon, heirloom tomato salad, and roasted peaches with pancetta, you may never leave home again. Place the lentils and 3/4 cup water in a rice cooker and cook for about 20 minutes or until the rice cooker turns to the "keep warm" mode; the lentils should taste about half done. Meanwhile, in a large (10in) skillet set over medium heat, cook the chorizo, breaking up any clumps, until it has begun to brown, about 7 minutes. 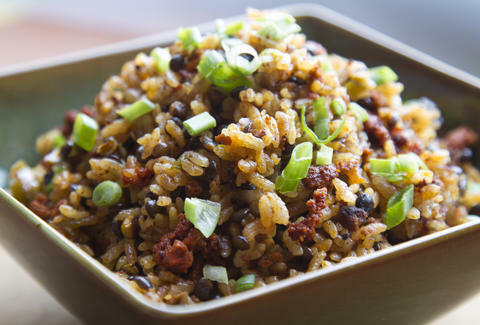 Stir the rice into the chorizo and cook, stirring nearly constantly, until it has turned from translucent to milky white, about 3 minutes more. Taste a grain of rice: it should be very close to done at the core. If not, sprinkle a little water, recover, and cook 5 minutes more. Gently fluff the mixture with a fork, reaching all the way to the edges at the bottom, to release steam and slow the cooking (though of course it can hold up to an hour or so in "keep warm" mode). Puree the herbs, vanilla and cream. To maximize from this base you could add multiple herbs, citrus juice, chili flakes, lime/lemon zests, and more. If pulling your own mozzarella, heat up a medium sized pot and salt it to taste. When water reaches a hard simmer, pour over cheese curds and when comfortable pull curds into balls and chill. When cold slice and distribute evenly between plates. 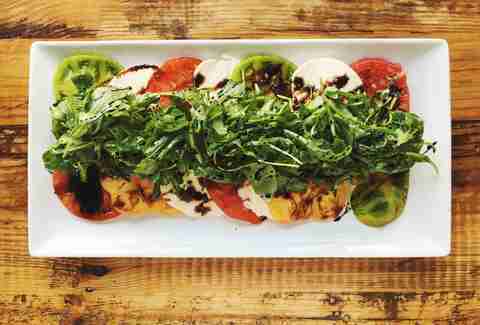 Toss arugula with half the vinegar and oil and mound over the tomatoes and cheese. To finish, drizzle salad with remaining oil and vinegar. Finish with salt and pepper to taste. Cut peaches into eighths, discard the seed. In a sauce pot add about 5 of the cut peaches and ghost pepper together, add 2 tablespoons of water and place over medium high heat until the peaches break down. Place the cooked peaches in a blender and puree until smooth, add salt to taste. Set aside to cool. Take the remaining peaches, toss with salt, and drizzle with a bit of olive oil, roast peaches for 5-8 minutes until slightly hot. Carefully remove from oven. 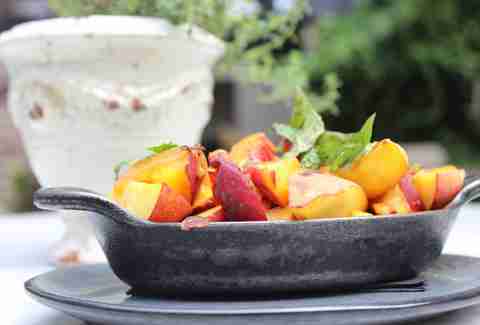 Place peaches into the mixing bowl, add a pinch of salt, freshly ground pepper, sliced Melrose pepper, and mint toss. Place desired amount of sauce at the base of the serving dish, and add Peaches over the sauce. Finish with crispy pancetta, and a bit more of the peach & Ghost pepper puree. Peaches could be left raw, using the same steps above. Season to your palate.